This temple is possibly the best-known and most photographed temple. 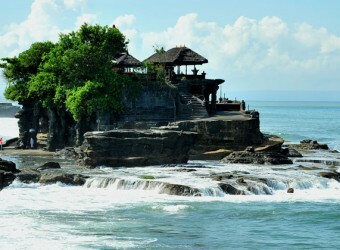 Tanah Lot Temple is built on the sunken rocks encroached by tide and rain for a long time. Usually, there are crowded by many tourists, so you should plan to arrive there at 16:00 latest and wait sunset time. You can come closer to when it’s low tide, however, heathens are prohibited to enter the temple as a rule. Tanah Lot sunset is very beautiful. It was low tide when I visited the temple so I could walk close to the temple. I also experienced purification. The monk gave me holy water then put the rice on my fore head. It was a good experience. Sunset with temple silhouette is very beautiful. I recommend this tourist spot when you coming to Bali.